View departure dates and availability for our cruises in the table below and complete your cruise booking online. All prices are per person in Australian Dollars and include VAT & HTT where applicable. Ready to discover the best of fiji? 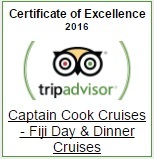 © 2016 Captain Cook Cruises. All rights reserved.